I know - you're wondering if you're in the right place! Yes, it's me, Ms Black and White with a Rainbow, trying my hand at something completely different. It's still pretty graphic but in a prettier way than my normal style. What attracted me to this photo was the two colours of grey and the two shades of red. I have 3 matching flowers in different sizes from the Stamps of Life. I placed all 3 on my acrylic block and stamped in Poppy and then in Coral, placing them so they look 'random'. I then added the Waltzingmouse leaves in Sand and Whisper. I used a Stampin' Up sentiment and finished it off with some little pearls. And I barely finished it before it was sold, so I guess it's good to branch out once in a while! This is such a simple sketch but so beautiful with its color and pearls. I love it! Hey, and I saw your entries for Gallery Idol - SO awesome. Good luck!!! Love it! A great take on your inspiration. Love the look of this card, Ardyth! 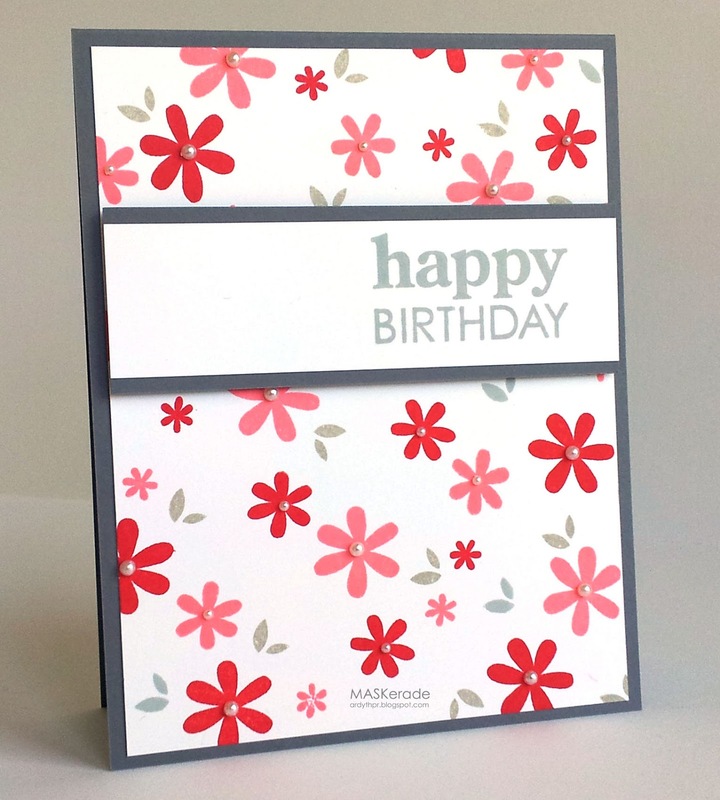 What a great design to stamp yourself or make a quick card using dp. Thanks for the inspiration! Beautiful birthday card...love how sweet it looks, fabby colors and all those pearls. Too cute! Such a gorgeous card Ardyth. Beautiful colours, great layout, and funky flowers. I love it. What a pretty card! The gorgeous little flowers look so lovely with the pearl centres. Perfect random placements of the flowers. Everything is sooooo well balanced! Love the bold sentiment too! Whenever I try to stamp randomly it always ends up looking totally uniform but this looks great! Love the red and coral with the grey. beautiful. I love the colors and all those pretty flowers.